Our QuickBooks Desktop experience goes back to 1998, being Certified every year since 2004. QuickBooks Online experience since 2008, Certified since 2014. General accounting and payroll experience for over 25 years. Of that total, 12 of those years was in public accounting. 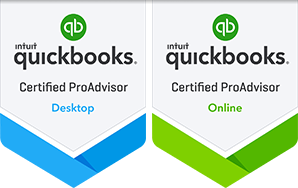 As a QuickBooks Certified ProAdvisor – Gold level, we receive discounts from Intuit on software and supplies. Those discounts are passed on to you when purchased through us. Our consulting fees are more affordable than those for services from many public accounting firms. Your request, whether by phone or email, will receive a reply by the next business day. We will strive to provide outstanding customer service at a reasonable price.